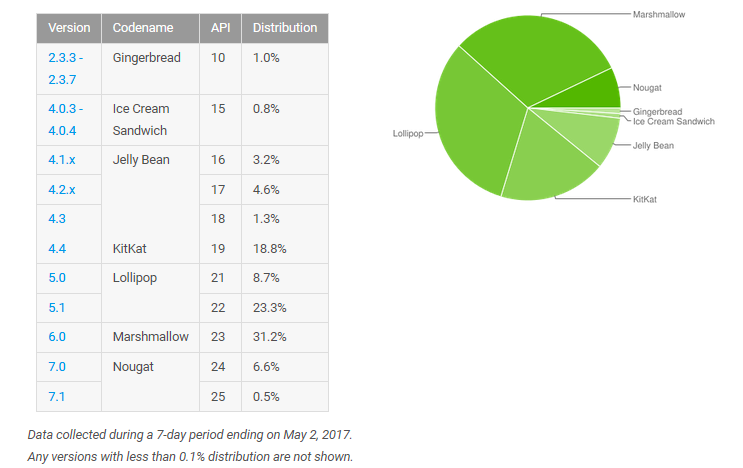 Android distribution chart for May 2017 is out now, and the numbers seem encouraging for Android 7.0 Nougat. The version has maintained a steady growth from last month’s distribution figures. One of the reasons behind the growth is the Nougat rollout by major OEMs like LG and Samsung in April. Going by the chart, Android 7.0 adoption percentage jumped from 4.5% in April to 6.6% in May while Android 7.1 could only garner 0.5%. For Android 7.1, there are just a handful of devices that are currently running it included Google Pixel and Nexus. The majority of the manufacturers are still rolling out Android 7.0 version for their devices, just as Samsung pushed it for its unlocked S7 edge. Samsung Galaxy S8 devices are being activated daily by new users, which means there could be many S8 units that recently accessed the Play Store during the data culmination period. The Galaxy S8 runs Nougat, which means that the rise in the share of Nougat could also be due to increasing sale of Galaxy S8 lineup. Meanwhile, a few low-end devices by OEMs such as Alcatel and ZTE have also received Android 7.0 update, last month. Moving on from Nougat, the growth of Marshmallow remains dormant at 31.2% while Lollipop still holds 32% share on the chart, which crowns it as the widely present version of Android. Regardless of its large share, Android 5.0 Lollipop witnessed a fall of 0.3% from last month, but its version 5.1 has made up for that fall with the exact rise. KitKat has stayed at 18.8%, Jelly Bean at 9.1%, and Ice Cream Sandwich still survives at 0.8%. What’s most surprising is that the six-year-old Gingerbread is still maintaining its presence on the chart with 1%, which means that it has higher registration than Ice Cream Sandwich. Google compiles the numbers from the number of Android devices that used the Play Store in a seven-day tenure until May 2. Well, it is good to see that latest versions of Android are claiming bigger share on the distribution chart. However, it is a long road towards widespread adoption of new versions, something that Google needs to work on.